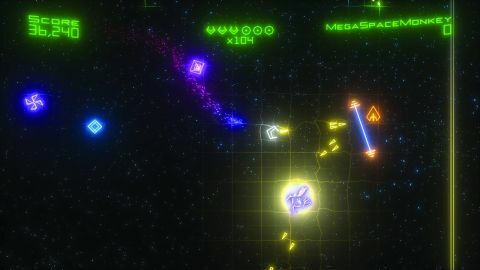 It%26rsquo;s almost three years since Geometry Wars: Retro Evolved first appeared on the marketplace, but three spin-offs later and it%26rsquo;s still classed as the pinnacle of twin-stick shooting. So just how do you go about reinventing the wheel? Developer Bizarre obviously knows. The key to this sequel is that it%26rsquo;s Retro Evolved... evolved. It%26rsquo;s bigger, it%26rsquo;s brighter and it%26rsquo;s found its groove as a soul-sucking, one-more-go, score attack addiction. Rather than being tucked behind an option in the menu, leaderboards are plastered everywhere. Each game mode displays a friend leaderboard beside its name, teasing you with scores and daring you to return. Jump into a game and it gets even worse; your closest competitor%26rsquo;s score will be shown in the top right, taunting you and sticking its tongue out at your attempt. The thrill is in the chase for glory, which is spread across six distinct modes. There%26rsquo;s Deadline %26ndash; a three-minute dash to collect as many Geoms as possible to boost your now-uncapped multiplier to ridiculous heights. King sees you seeking refuge in timed safe-zones with a twist: you can only fire when in a zone and only collect Geoms when you leave its safety. Office favourite Waves returns, while Sequence asks you to survive twenty short levels of increasing difficulty. Finally, there%26rsquo;s Evolved, which is the classic Retro Evolved game with a multiplier that doesn%26rsquo;t reset after death. Retro Evolved 2 is a cacophony of light and sound to any spectator, but a zen-like trance for the player. Description Retro Evolved 2 is a cacophony of light and sound to any spectator, but a zen-like trance for the player. Bizarre Creations has managed to reinvent the wheel for another soul-sucking, one-more-go, score attack addiction.